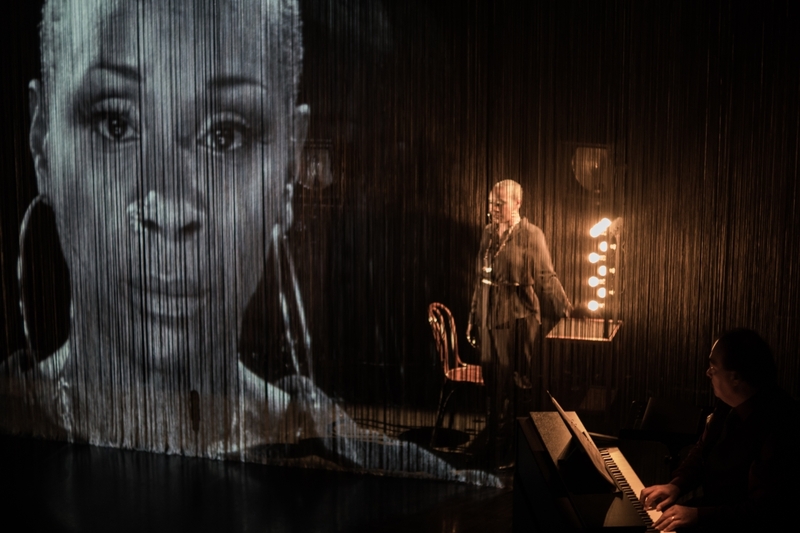 Anyone picking up a ticket for Nina – A Story About Me and Nina Simone and expecting a straightforward tribute concert was in for a surprise when Josette Bushell-Mingo took to The MAC stage on Friday evening. But Josette quickly stepped out of Nina’s shadow to pursue a line of questioning that asked the audience whether the discrimination that the US civil rights movement fought against in the 1960s still persisted? Questions which also echoed in this place with our own recent civil rights movement anniversary activities, and our own continuing relationship with guns. Other vulnerable and minority sections of society are named, but the tightly scripted monologue kept its focus on the murder of black teen Laquan McDonald, shot by a white police officer 16 times, as well as a number of other well-known fatal shootings. The house lights were raised as the audience are jolted out of passive listening and asked to think and respond. It was intense and there was no fissling in the stalls. The only person brave enough to interrupt Josette was her pianist, a device that lifted the tension. The zenith of the provocation comes in a breath-taking section of the show in which Josette admitted afterwards in the Q&A that she pushes the audience to the point of her own discomfort. That’s well beyond where you’d expect or prefer her to stop! A few people escaped soon after to the toilet, but everyone seemed to return. It was intense, and fearless, though also quite controlled. “Theatre is the only safe place to be so challenging today” Josette explained. The songs that Josette now sang more freely seemed familiar, but I’m almost sure the lyrics had been sharpened up to reinforce the message. Gospel, jazz, blues, folk. It’s all within Josette’s range of talent. Black and white video footage projected into a string curtain was particularly innovative with video-based spotlights scanning across the performer. The show’s lighting with its rich golds and shadow effects were as exquisite as the band’s score. The alchemy of ideas and timelines was powerful. The fusion of Bach and Kool & the Gang was novel. The staging stripped away. The audience applauded as if they sensed the pressure lifting. Though Nina’s ‘understudy’ was never going to roll over and provide relief quite so easily. Feeling Good with its lyrics “It’s a new dawn / It’s a new day” took on a new poignancy. The final I wish I knew how it would feel to be free was truly heartbreaking and full of longing. Yet there was hope. The revolution wasn’t won in The MAC last night. But there are small changes and small acts that the audience can perform to take up our part in the struggle. Uncomfortable, unsettling, and amazing. Festival magic.